History of the Nightingale, 2 years in the making, now for sale online! Earlier this year, I was thrilled to share that Piecework Magazine published my article on the history of the knitted nightingale (January/February 2017). 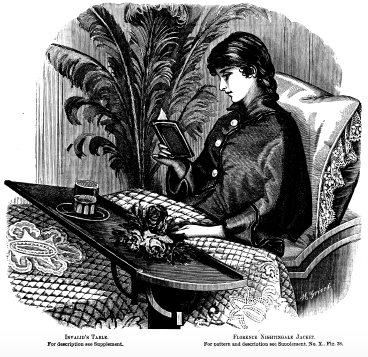 I started by explaining that “The nineteenth-century wrap that became known as “The Nightingale,” a garment worn over the shoulders in bed, was the Victorian ancestor of the modern-day slanket (blanket with sleeves) or snuggie. Florence Nightingale Jacket in “Harper’s Bazar,” September 5, 1885. “Also called a bed jacket, dressing gown, shawl, wrap, cape, cloak, or sacque, the Nightingale was, over time, made from different fabrics.” The research was a fun romp through the early history of nursing and Florence Nightingale’s career, the Crimean war, wartime knitting, and yes, even Fashion History (an 1856 issue of Godey’s pictured a mantle called the “Nightingale” likely based on published images of Florence Nightingale). Knitted Nightingale, Originally published in PieceWork January/February 2017. My article also included a re-worked pattern for a Knitted Nightingale, which I’m happy to share is now for sale on the Interweave website. “This pattern is based on the Knitted Nightingale in Weldon’s Practical Knitter Sixteenth Series. With the exception of the choice of ribbon color, this knitted nightingale is true to the original Weldon’s pattern. The lapels on this Nightingale are fairly wide and are intended to imitate those seen in portraits of Florence Nightingale from the 1850s. They can easily be adjusted to your own preference. Extra length in the dolman-like sleeves allows for a generous range of movement and an added sense of coziness.” It was a long-time project that began July 16, 2015, and finished with a crochet edge on May 4, 2016.